BBT is a translation agency located in the United States. We provide certified translations of birth certificates for any purpose. We are members of ATA - American Translators Association. If you prefer to talk to a live agent, please call us. Our certified translations bear a raised seal on the certification. In many countries, birth certificates are issued in “full” and “abstract” styles. The former is an exact copy of the original birth record, while the latter contains limited information about the child’s birth. For most legal purposes, “full” certificates are required. However, both styles of birth certificate should be translated clearly, precisely and free of error. A notarized affidavit of the agency representative's oath regarding the document's completeness, accuracy and his own level of competency. Translations are printed on the BBT Breaking Barriers Translation Services agency letterhead. An agency stamped and signed copy of the source document used in the translation. 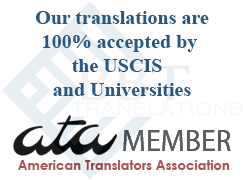 We are members of ATA - American Translators Association and we guarantee their acceptance by immigration, universities/colleges, employers and any entity that requires a certified translation. 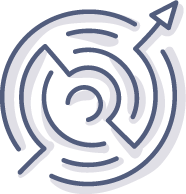 Our team consist of professional translators native in the source language. They have vast experience translating official certificates such as birth certificates, marriage certificates, divorce certificates, death certificates and more.